safety valves wrenched into place. by) those unread stacks of paper. what is the sound of a birth defect? 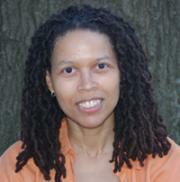 Evie Shockley is the author of four collections of poetry: the new black (Wesleyan, 2011), a half-red sea (Carolina Wren Press, 2006), and two chapbooks. Her study Renegade Poetics: Black Aesthetics and Formal Innovation in African American Poetry will be published by the University of Iowa Press in 2011.